This article is about the Futurama character. For the physicist, see Stephen Hawking. Stephen William Hawking was a theoretical physicist and a member of the Vice Presidential Action Rangers. In the 31st century, he has become a head in a jar. Like Al Gore's, his jar is rocket powered. He still can't speak so his jar acts as a robot with the same speaking voice. He has the ability to shoot lasers from his eyes which can temporarily stun people, though he never knew he could do that until he actually did it. In a non-canon segment, he ultimately quit physics and became a voice-over actor for cartoons. Hawking appears to be extremely lazy and mean, often stealing credit for other people's discoveries, frequently naming them after himself - for example the Fry-hole, which he called the "Hawking hole" in spite of Fry being the discoverer. When asked if he was the one who created gravity, he played along, though his answer certainly wasn't definitive. Hawking misuses his power and name in academic circles, assuming that no-one will believe Fry over him (which is probably quite true). In a What-If scenario of the year 1999, Hawking is shown to be a regular at Panucci's Pizza, and he often steals credit for other people's discoveries, frequently naming them after himself. He, Fry and the rest Action Rangers were sucked into the Fry-hole at the end of the scenario. Even though in real life, Hawking is completely paralyzed, in animated form, he is able to makes some proper facial reactions. This mistake was made on his appearances on The Simpsons as well, though in his appearance in The Beast with a Billion Backs he appears to be completely paralyzed. Stephen Hawking: Toss it in the garbage. 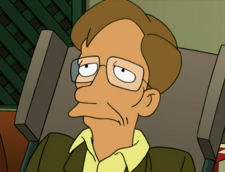 Leela: "Black-Hole-Hawking?" Wow! If I knew I was going to meet you I would have done something with my hair. Stephen Hawking: You didn't. I checked the invariance of your lagrangian. Hubba hubba. This page was last edited on 8 January 2016, at 21:05.